I received my very first computer 45 years ago -- back in 1973. Admittedly, it was merely a toy, but it was long before the iPhone's introduction more than thirty years later in 2007. In fact, not a single Millennial was even alive in 1973 when I got my first computer. I would argue that proves I've been a "digital native" a whole lot longer than they are. I'm also a true "digital native" who will be age 50 next year. (Catch a relevant article on Gen Xers turning age 50 at https://www.theepochtimes.com/gen-x-turns-50-were-doing-well-thanks-for-asking_1925959.html for more detail). Millennials can only wait enviously behind Gen Xers on the distinction as "digital native", even if marketers or dumb employment recruiters think it means them. Genuine digital natives precede Millennials by at least two decades, probably even more than that. After all, it was Gen X kids like Matthew Broderick who saved the world from a computer-initiated nuclear armageddon a decade later in the 1983 movie "War Games," so Gen Xers have an indisputable claim that the kids who once camped out in front of Apple Stores are no more digital native than we are, because we've been natives longer than they have by decades. Early mobile phones (which were the size, shape and weight of bricks ... and had power that only lasted for 30 minutes), for example, were portable, but were analog and could only make audio telephone calls. Today, smartphones are pocket-sized computer devices that are perennially running out of power, memory capacity, and arguably don't work very well if you want to preserve your eyesight beyond age 35. "You'd think that toy computers would have reached their height in the last decade. 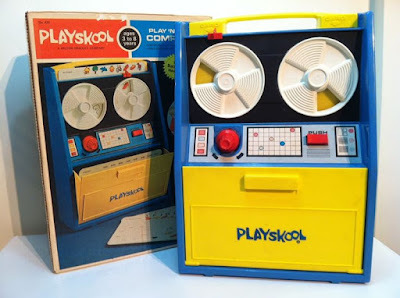 This Playskool Play and Learn Computer is from 1972 and is a spectacular reminder that a) everything is toyable and b) computers have always been our future." My own experience with computers actually began around 1973 when I was around four years old with the very Playskool Play 'n Learn Computer depicted in the Gizmodo article above. Note that in the early 1970's, Playskool was still an independent toy company based in Wisconsin (it wouldn't be acquired by toy-giant Hasbro until 1984). From the company's earliest days in the 1930's or so, its niche was always making toys for preschool aged children centered around the idea that its products could help develop coordination and stimulate the minds of small children. As a precocious child, I was always troubled (and a bit insulted) by the fact that in the company name, "school" was incorrectly spelled "skool". I was too young to understand that corporate names could be completely made-up. The absolute top of my gift list for 1973 was the Playskool Play 'n Learn Computer. I really loved this toy, and it was all I talked about in anticipation of that holiday. On Christmas morning that year, I literally asked which wrapped gift was the computer, but my parents forced me to calm down, so I zeroed in on the box that looked like it might be the same size and opened that one first. My family bought me plenty of other things that year, including clothes which I don't think any child has ever really wanted for the holiday, but usually got anyway. I don't recall what any of the other gifts I got that year were because that computer was the only thing I really wanted. I wanted that toy more than anything until Atari 2600 (it was called the Atari Video Computer System or VCS at the time, and it wouldn't be renamed Atari 2600 until a few years later) came about a decade later. Kids like me instantly recognized the potential of computers, and many would go on to make that a reality. For example, Gen Xers are behind things we take for granted today, such as Google, Twitter, Facebook and even online banking. Realize that in 1972, I was only three years old, but I still saw computers featured on television programs my parents watched, and even on TV shows including Captain Kangaroo. At the time, those were all big mainframe computers, rather than personal computers (the ones I saw were of the sort featured on the popular 2016 film "Hidden Figures" which supposedly took place in the late 1960's, see below for more detail). Most of the depictions of computers in those days were big, bulky things (with reel-to-reel storage tapes that stored many programs and most data) that was also the era where computers kind of f'd things up. Computer screw-ups were frequently shown in late sixties and early seventies TV shows. Whether it was turning someone's electricity off because the computer mistakenly credited their payment to another customer's account, or in the case of "War Games" mistakenly initiating Global Thermonuclear War with Russia because the computer mistakenly believes it's just another computer game, or when ATM's withdraw thousands of dollars from someone's account but only giving them a twenty dollar bill. 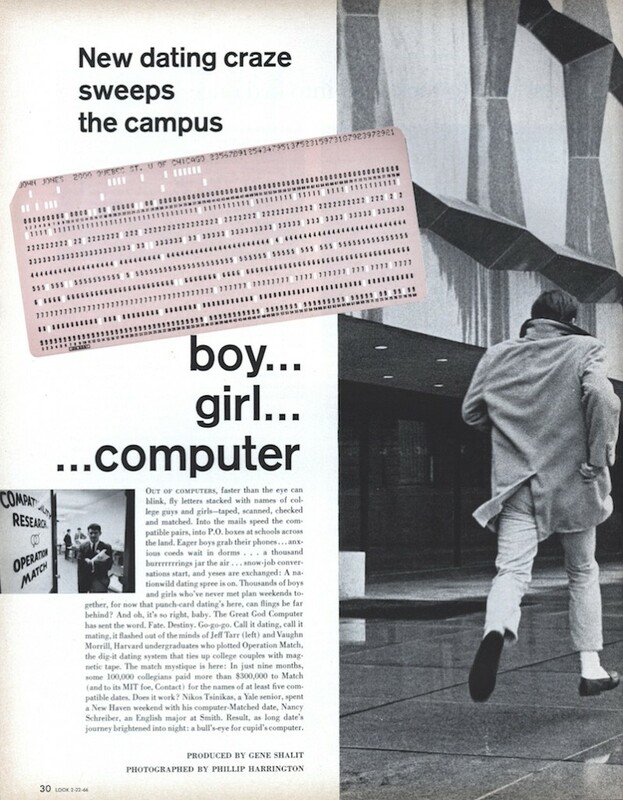 Occasionally, there were humorous takes on "computer dating" which began in the 1960's but was a recurring theme into the 1970's. For example, I remember seeing a rerun of the TV show "Love, American Style" about the humorous results of computer dating gone wrong. People submitted their vital stats to a computer dating service along with lengthy questionnaires (usually on a paper form where the respondent colored in a particular circle to answer a certain way not too dissimilar to the way SAT's used to be handled). The New Yorker reports (see HERE for a Business Insider article with a link to that original article in New Yorker plus some relevant other information) that one early computer dating service made people answer some 1,400 multiple-choice questions, and then charged them $5.00 to have a computer find their match (which was equivalent of about $30.00 in 2018), though an advertisement from a rival in Look magazine also dated 1966 showed its price at $3.00. In those days, computers were routinely depicted with suspicion and disruptive. But they were mainly disruptive to older people who grew up in the days when computers were simply not around and they did not see much need for them. Truth be told, computers did automate many processes that often took more human effort in the old analog world, and also rendered some jobs people used to do as obsolete. It's a similar dialogue now going on about so-called AI (the acronym for artificial intelligence, see a ZDNet article HERE for more). The Playskool Play 'n Learn Computer was designed to look like a mainframe computer, only it was a mechanical toy that used no batteries or external power source to compute if child had correctly found the right answer. 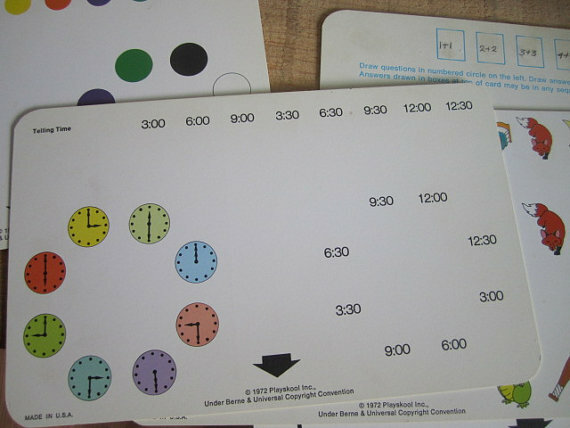 Instead, it had five double-sided cards included. Rhyming words, similar pictures, beginning sounds, telling time, colors, adding facts and related objects, identifying parts of a whole, matching words to objects, and a blank card for child to fill out. As a toy, I eventually mastered the handful of questions, and the company failed by not selling any additional cards for this computer, so I eventually lost interest. But for a brief time in the early seventies, I thought it was about the greatest toy a child could have. 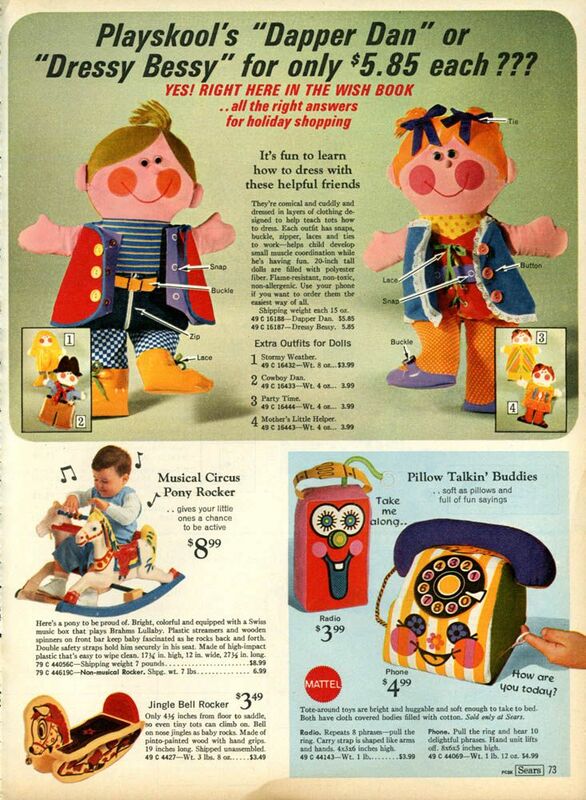 Around the same time, Playskool also sold what could best be described as dolls and stuffed animals made from cotton fabric and polyester fiberfill (petroleum-sourced polyester was all the rage those days). Perhaps the most famous of those "dolls" was known as "Dressy Bessy" and her male counterpart was "Dapper Dan", both of which aimed to help teach small children to learn how to dress themselves, with common parts of clothing including zippers, snaps, buckles, buttons, and shoelaces. At the time, Playskool even licensed the product to the pattern company that sold Simplicity patterns which sold in fabric and sewing shops so homemakers could make these toys by themselves (presumably to give as gifts to children). 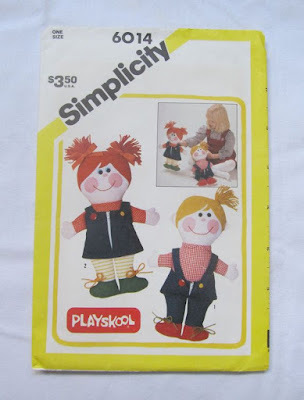 Whether they were any cheaper (if a pattern sold for $3.50 but the toy itself sold for $5.85 as it was priced in the Sears annual Wishbook in 1973 or so, one need not be a math genius to determine that the patterns plus the cost of fabric and time to make the Dressy Bessy meant it wasn't necessarily a great economy bargain). Hasbro brought this particular toy back to market in 2001, but the market was less receptive at the time, perhaps due to a shortage of children of the right age to buy for and a glut of toys to choose from. The toys were bright and colorful, although they were hardly fashionable even during the years preceding disco, polyester leisure suits, and platform shoes. Indeed, some writers have jokingly stated: "Dapper? Not so much." Nevertheless, Bessy and Dan have remained a perpetually popular product line for Hasbro, even if not perennially available. 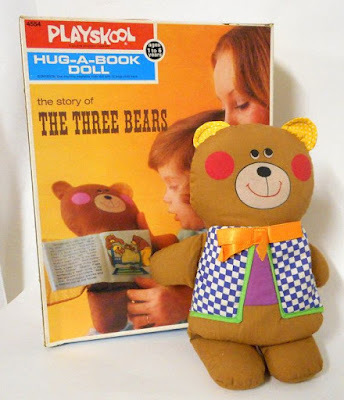 Using the same basic designs, the following year, the company expanded to offer what it called Hug-a-Book dolls, which featured the same garish colors (at least it did on the Jack and the Beanstalk and Little Red Riding Hood toys) in all of the Hug-a-Book line. By that time, I was about 4 and already starting to read (at least I knew the stories by heart, so the words on the page looked familiar enough). The company took several favorite fairy tales and downsized the stories to fit on tiny, 12-page (made of silk-screened cotton) story books which were fastened to the stomach of these dolls. Initially, it focused on just a few such stories, including Jack and the Beanstalk, Little Red Riding Hood, The Three Little Pigs and The Three Bears. At the time, I was a four year-old child who was already very familiar with those stories, and I wanted one a lot like Ralphie wanted a "Red Rider" for Christmas (that's a reference to the 1983 movie "A Christmas Story"). I received the Hug-a-Book Jack and the Beanstalk for Christmas, and in the following April for my birthday, I received The Three Bears. Eventually, the cover to Jack and the Beanstalk tore off, but my mother was a sewer, and she was able to fix it for me. I grew older in the years that followed, so I outgrew all of Playskool's offerings, and would be mesmerized by things like The Six Million Dollar Man and the Bionic Woman (having aluminum lunchboxes with Steve Austin's image on it), as well as standard fare like Hot Wheels, Matchbox and Tomy Pocket cars. I would later get handheld electronic games including Mattel's Electronic Basketball and Football, and rival Parker Brother's Merlin (catch my post on that by visiting http://hgm.sstrumello.com/2012/09/preservation-and-resurrection-of.html for more). 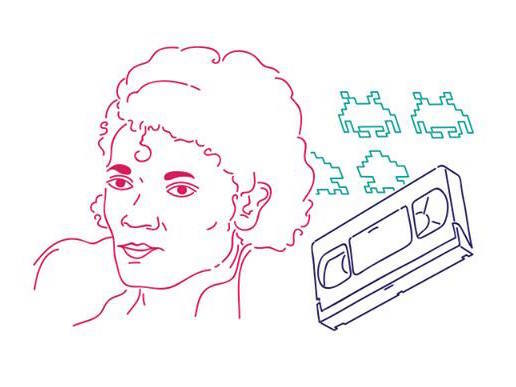 By the end of the decade, Atari's Video Computer System as it was originally called (later renamed Atari 2600, catch my post on that at http://hgm.sstrumello.com/2012/07/atari-celebrates-40th-anniversary.html for more) and the endless pursuit of new home video games for that would capture my attention until my interest shifted to real, personal computers which in hindsight, were incredibly overpriced and underpowered, but were never Apple anything as the company nearly went bankrupt and was more famous for selling vaporware than good design or true technical expertise. It was Lotus Development Corp. and a company known as WordPerfect that preceded even Microsoft as far as computer software that actually made computers run (Microsoft only for the operating system known as DOS or disk operating system). As much as hipsters like to believe that Steve Jobs was the true computer visionary, he really wasn't, and his company got off to a very rocky start. As a side-note, in 1978, Playskool itself would introduce a real (non-mechanical) computer toy called Alphie and a decade later in 1983, and pretend, musical mobile phone, but the original Playskool Play 'n Learn Computer will always remain as one of my all-time favorite holiday gifts. But anyone under the age of 40 in 2018 who thinks they are a "digital native" is more of a liar than a "digital native". Gen Xers gave the world Google and Twitter, and Baby Boomers like Bill Gates were pivotal in making those things happen. 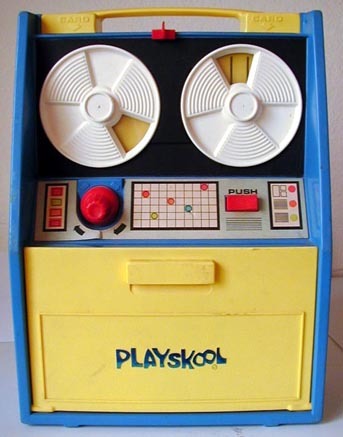 But toys like Playskool Play-n-Learn Computer were the first introduction to the digital world for a generation of people who continue to define the term digital natives. Sorry hipsters, you were about two decades late to the game.